The Samsung Galaxy A8 is among the most prominent visitors to the rumor mill recently, and there's little we don't know about its looks and hardware by now. The smartphone was the star of a handful of photo shoots, as well as a hands-on video, not to mention it passed FCC and TENAA certification. What has remained unclear up until now is when the smartphone will hit the shelves, and new intel on the matter courtesy of nowhereelse.fr aims to fill in that blank. The rumor has it that the Galaxy A8 will be launched in China on July 17. 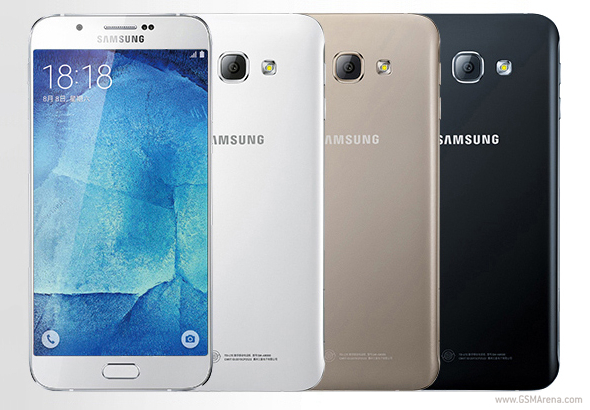 The Samsung Galaxy A8 sits atop the A-series and sports a 5.7-inch FullHD AMOLED display in a body, which resembles a scaled up Galaxy S6. The Snapdragon 615 powers the handset, joined by 2GB of RAM and 16GB of expandable storage. Imaging is covered by a 16MP f/1.9 main camera and 5MP front shooter, and there's the now mandatory fingerprint reader in the Home button. The smartphone is tipped to be priced at the equivalent of €439 ($494), which makes sense, given the price of the Galaxy A7 which hovers in the €350-€380 ballpark. When it will leave the boundaries of China is yet unknown.